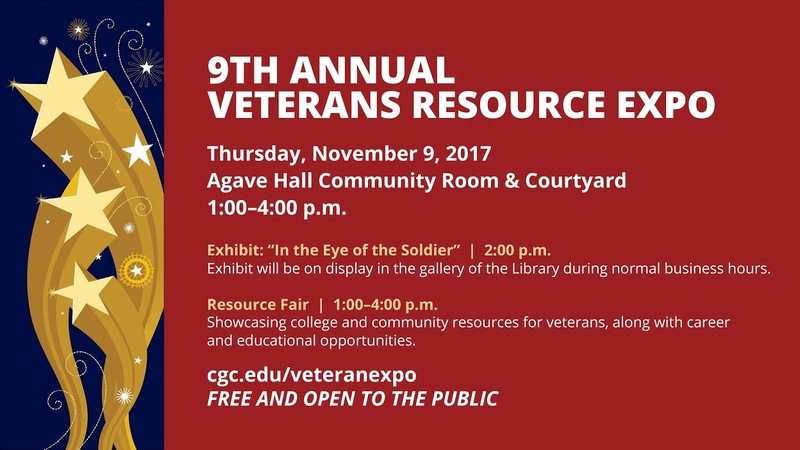 Chandler-Gilbert Community College (CGCC) is hosting its 9th Annual Veterans Resource Expo on Thursday, November 9 from 1 to 4 p.m. at CGCC’s Pecos campus. The event features a resource Expo with over 30 college and community groups serving veterans along with the display of the “In the Eye of the Soldier” World War II exhibit courtesy of CGCC, the City of Chandler, and the East Valley Jewish Community Center. The extraordinary exhibit features scanned photos taken by World War II Army veterans Emmett Sturgill and Donald Ornitz in April of 1945. The photos display the heroism of U.S. soldiers as well as the realities and experiences they faced when U.S. forces liberated more than 20,000 individuals from the concentration camps near Linz, Austria. "The Veterans Expo allows us to showcase college and community resources that may help our veteran students be more successful, and gives us an opportunity to offer our heartfelt thanks to CGCC's more than 500 student veterans in the week leading up to Veterans Day," said Kirksey. Exhibitors from a variety of governmental and community organizations will be on-site to provide information about their health and wellness, education and job resources. Organizations include: ASU Veterans Upward Bound; Arizona DES Veteran’s Workforce Services; Army NG Transition Assistance; CGCC Student Veterans Organization; Arizona Department of Labor; Disabled American Vets (DAV) Ch 8; East Valley Veterans Education Center; Fleet Reserve Assoc. Branch 163; Phoenix Fourblock; Homes for Heroes; Social Security Office; The Veterans Directory; VA Health Care: Transition & Care Management; VA Health: VA Eligibility, HR, My Healthy Vet, Women's and OEF, suicide & homeless; VA Vets Success and the VA Mesa Vet Center. Employers such as the Arizona State Prison, Home Depot and Chandler Police Department will also have an on-site presence. The 9th Annual Veterans Expo will be held inside the Agave Building Community Room at the Pecos Campus located at 2626 E. Pecos Rd. from 1 to 4 p.m. The event is free and open to the public, particularly student and local veterans. Complimentary refreshments will be served.